Do you want to change the iPhone notification ringtone? The default ringtone of iPhone is good, but many people like to have a unique and different notification sound. One of the easiest and simplest way to customize your phone is by changing the ringtone. It is not a challenging task to change the ringtone. 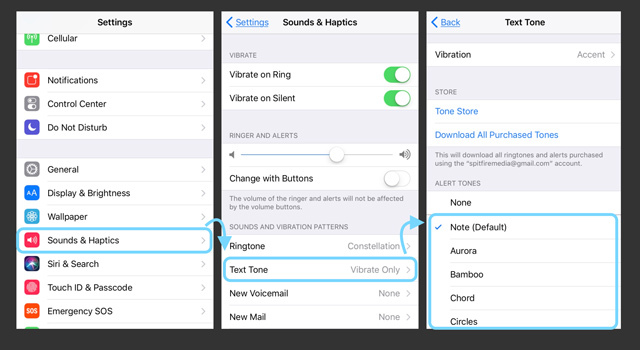 In this article, we have created an extensive guide for you to change notification ringtone on iPhone. 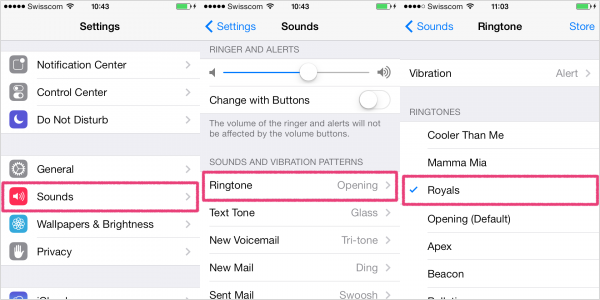 Read on to know everything about customizing your iPhone by changing the ringtone. Part 1: How to Change iPhone Notification Ringtone? Part 3: How to Make iPhone Notification Ringtone of Your Own with Third-Party Program? Follow the steps below to change iPhone notification ringtone for incoming phone calls. Step 1.The first thing that you need to do is to open the Settings on your iPhone. Step 2.Then, click on Sounds (Sounds & Haptics for some version) and go to Ringtone. Step 3.You can view the list of ringtones that are available on your iPhone. Step 4.Click on the ringtone that you would like to select. You can even preview tune before choosing it. It is pretty much the same as changing notification ringtone for phone calls above. Follow to change the sound effect for all messages coming to your iPhone. Step 1.First, you have to go to Settings and click on “Sounds” (Sounds & Haptics for some version). Step 2.Next, you must click on the “Text Tone” button and you can choose any ringtone you like. There are custom ringtones under the section Ringtones, while the default will appear under the Original segment. Step 3.You can select the ringtone you like and close the Settings. If you are fed up with your default iPhone ringtone, you will not be alone. There are thousands of iPhone users who are tired of listening to their default ringtone and want to have customized sound effect. Here are top 3 websites for you to download iPhone notification ringtone. One of the top sites to get your favorite ringtone is Zedge. This site has a lot to offer, from wallpapers to ringtones to notifications to games. You can easily search for any ringtone of your favorite movie or TV series or games. It has a collection of ringtones from classic to rock and country. Before you can download the ringtone, you can listen to it. The good news is that it is for free, and you can download ringtone to your iPhone or computer. Another great website to download iPhone notification ringtone is Mob.org This website offers a wide range of ringtone to download freely. It allows you to listen to any ringtone by searching under the list of artist and genre. The downloading of ringtone is easy; all you have to do is click the download button or scan the QR code. Moreover, you can download wallpapers, themes, and games available on the website. For iPhone notification ringtones free download, you can visit Tones7. This site is perfect for downloading ringtones for iPhone. Looking for various ringtones is easy as ringtones are categorized. The simple design of the website makes it convenient to download as many ringtones as you like. This website enables you to listen to the ringtones before you can download them. You can find both MP3 and M4R ringtones. There was once a time when you couldn’t make ringtones for iPhone. Now, making your own ringtone is no longer a new trend for iPhone users. The function of Ringtones is not limited to just notifying people. It has become a way to express people' mind. For this reason, people make ringtones from their favorite songs. In order to make ringtone without any hassle, you should use iMyFone TunesMate, not only a professional iPhone transfer, but also a ringtone maker. 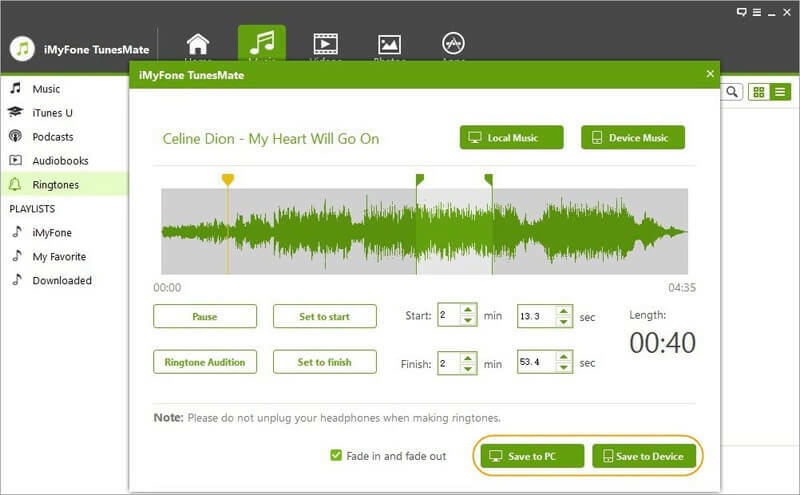 Allows you to manage playlist and create a ringtone from your favorite song. Allows you to set start and stop time based on your preference. Allows you to preview ringtone before saving it onto computer or iPhone. Allows you to choose source music from either your device or computer. 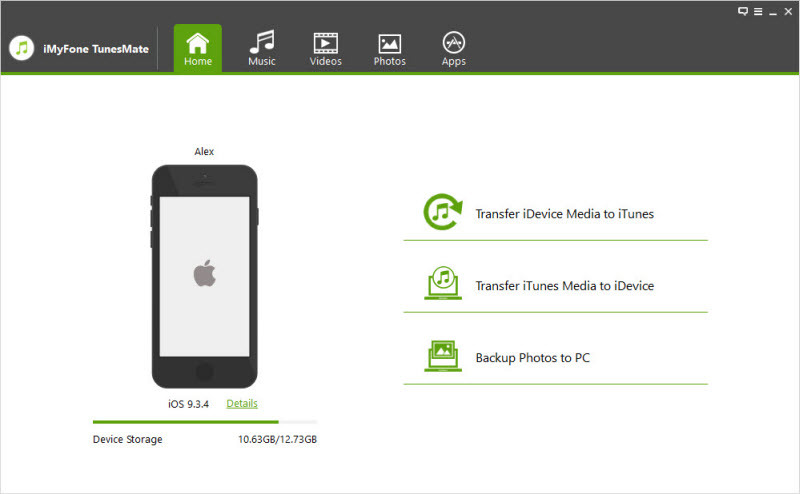 Allows you to transfer ringtones from iPhone to iTunes, or vice versa without limitations. Step 1.First, you will have to start the iMyFone TunesMate on your computer. Keep in mind to connect your iPhone to the PC. 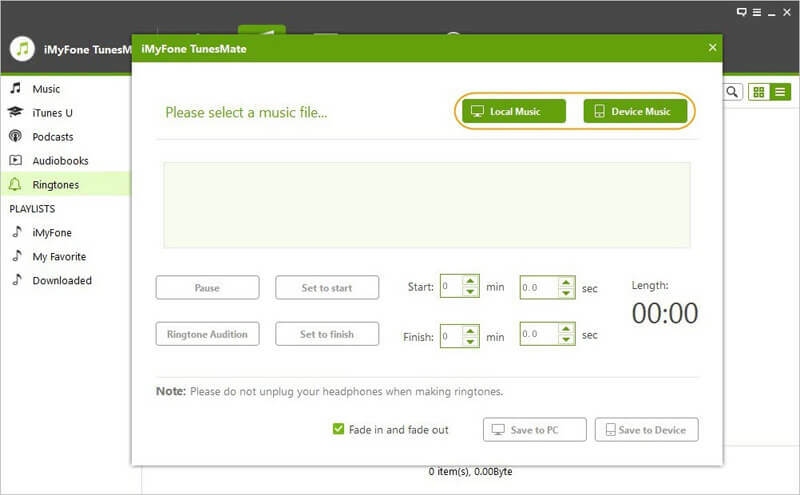 Step 2.On the main interface of iMyFone TunesMate, tap on "Music" section located at the top of the menu, choose "Ringtone" from left side bar, and click "Ringtone Maker" at the sub-menu bar. Step 3.Import source song from which you would like to make as iPhone notification ringtone. You can import music from computer or your iPhone device by clicking "Local Music" or "Device Music" respectively from an pop-up window. Step 4.When the song is playing, you can decide the starting point and ending point of the ringtone. 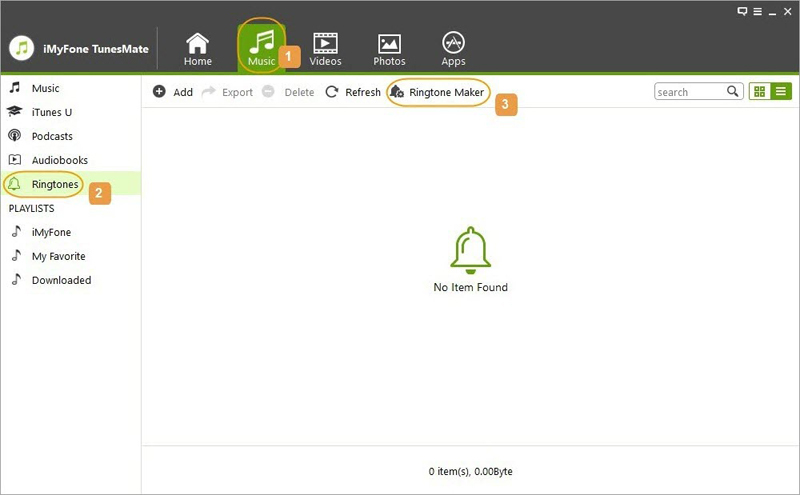 Step 5.You can preview the ringtone you created by tapping on "Ringtone Audition". The ringtone can be saved on your iPhone as well on your computer. Click "Save to Device" to save created notification ringtone on your iPhone. All in all, there you go, follow these easy steps and have a customized iPhone notification ringtone.